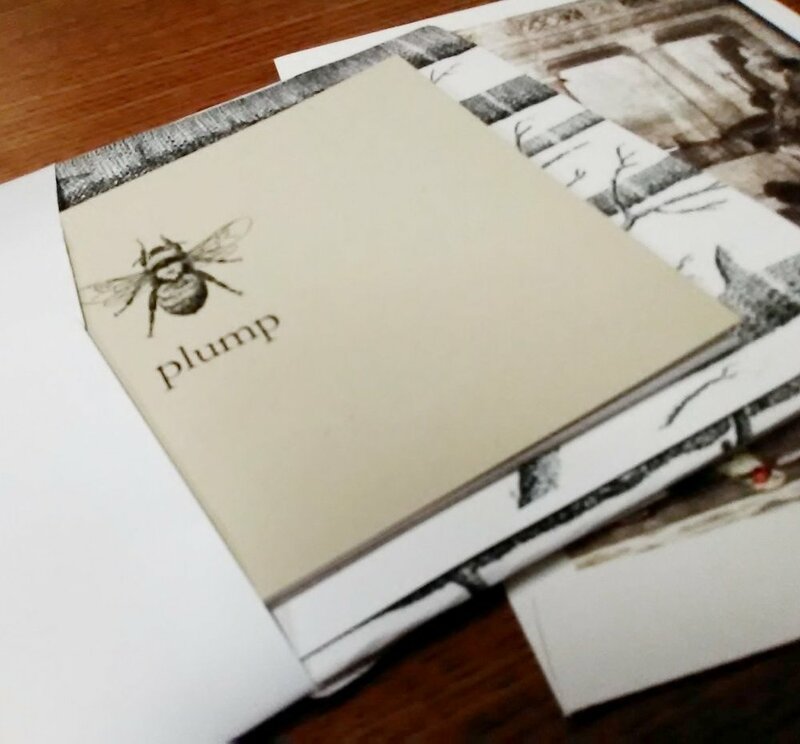 Kristy Bowen of Columbia College Chicago shared these beautiful images from her Book to Art Club’s yearlong Grimm fairy tale study and project. 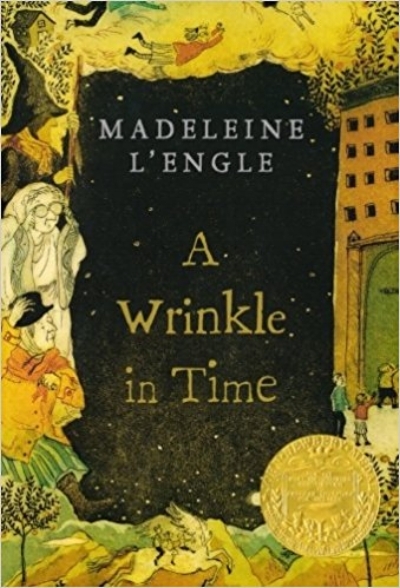 We are so excited to have you participating in the very first Book to Art Club Big Read, “A Wrinkle in Time” by Madeleine L’Engle! Here are some images that we have received so far, and we will continue adding as we receive. Readers, start your pages! It's almost time for the very first Book to Art Club Big Read. The Book to Art Club will be celebrating its five-year anniversary this October, and to honor this momentous occasion, we are inviting all of our clubs to participate in the Book to Art Club Big Read in October and to send us copious pictures of the events to share on this blog. The Book to Art Club was recently invited to speak at Camp Read-a-Lot in Mankato, MN by the Traverse des Sioux Library Cooperative. Camp Read-a-Lot was a one-day professional development conference for librarians and educators of young readers, grades 2 - 8, that included book discussions, making activities and a keynote talk on choosing appropriate Native American Literature for lessons and collections by Jane Harstad, Director of Indian Education for the Minnesota Department of Education. At Camp Read-a-Lot, I had the opportunity to share how the Book to Art Club was started by the Library as Incubator Project founders Laura Damon-Moore, Erin Batykefer and Christina Jones (Endres) under their mission "...to promote and facilitate creative collaboration between libraries and artists of all types, and to advocate for libraries as incubators of the arts." The Book to Art Club's purpose is to show how reading combined with a hands-on project helps achieve a richer understanding of the book's themes, history and context. After a brief presentation, I led a book discussion with collaborative LEGO building as a project on "The Stars Beneath Our Feet" by David Barclay Moore. I had a wonderful time with the campers, and at the other presentations, and I hope this will lead to the start of our first Minnesota chapter. 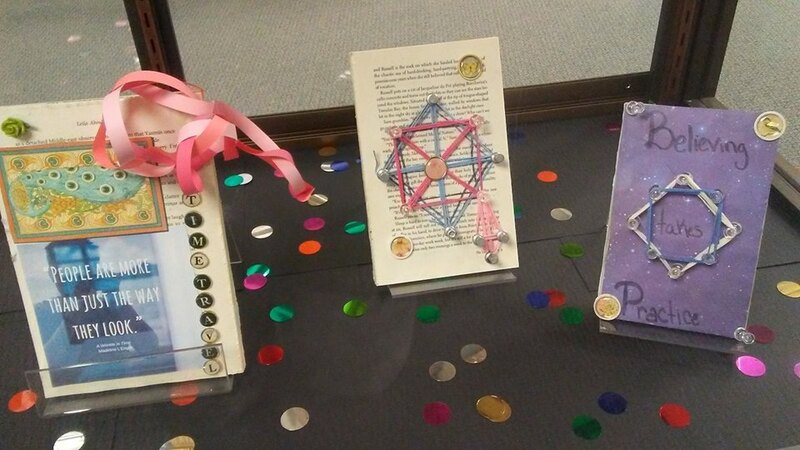 Odenton Regional Library recently hosted their very first Book to Art Club session. They read "Howl's Moving Castle" by Diana Wynne Jones, watched the anime film by Hayao Miyazaki, and then compared the two during their discussion as they created their hands-on projects. Thank you Rebecca Rubenstein for sharing your pictures! We look forward to watching your club grow and seeing what you do next. Today's post comes from Stacy Brown of Davis Academy in Atlanta, Georgia. What a splendid idea it was to incorporate digital apps into their projects. What an even more wonderful thing it was to bring mothers and daughters together to celebrate that girls are beautiful for being themselves. Well done! We had our boys book club read Ghost by Jason Reynolds and then create their own tennis shoes using augmented reality apps. Our girls book club read Bubble by Stewart Foster and made bubble tea and our own bubbles out of a recipe while discussing the book. 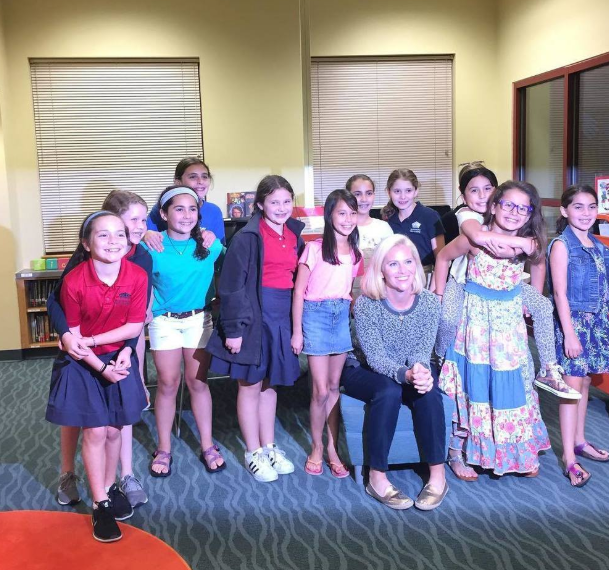 We did a mother/daughter book club with our girls and read Strong is the New Pretty by Kate Parker, a photo journalist. We had her come to visit and we took “strong selfies” of ourselves. Our boys also read The Wild Robot by Peter Brown and we made robot paper toys. The boys have an upcoming Skype visit with author Jennifer Brown this Friday to discuss . Our final girls book club of the year will be on Monday of next week discussing Prairie Evers by Ellen Airgood. We are still planning our activity for that one though. The last few months have been extra inspiring for Mead Public Library's Book to Art Club. We read The Cellist of Sarajevo by Stephen Galloway and reenacted our own war by shooting watercolors out of squirt guns at our papered target. We then used the stained papers to build a city together, and other elements from the story, as we considered the reading. Monsters were drawn while we discussed The Boy Who Drew Monsters: A Novel by Keith Donohue. Magazine people were unwound and reassembled as we dissected Unwind by Neal Shusterman, and stuffed animal warriors were created as we explored the post-apocalyptic Mort(e) by Robert Repino. We also had the wonderful opportunity to tour John Michael Kohler Arts Center's exhibit Out, Out, Phosphene Candle by Joy Feasley and Paul Swenbeck with its nautical elements before we discussed Twenty Thousand Leagues Under the Sea by Jules Verne and designed our own Nautilus submarines and sea creatures. And, we created paper floral wrist corsages and moon garlands as we deliberated over Anna-Marie McLemore's When the Moon Was Ours. It has been a busy few wintry months and we are having a blast! 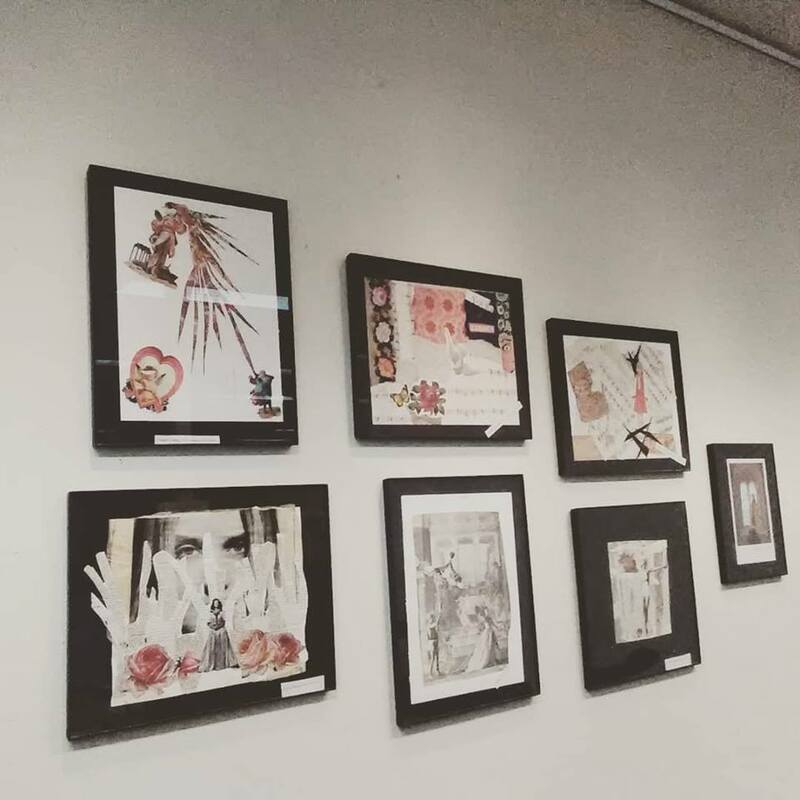 Camus Public Library's Book to Art Club, and the Library as Incubator Project, was the subject of this delightful article written by local author and Book to Art Club member Kristina Lotz. Thank you for sharing this with us, Judy Wile! This was wonderful to read. I know I'm feeling inspired and excited to start a new year! We are pleased to introduce one of our newest Book to Art Clubs, Columbia College Chicago Library. 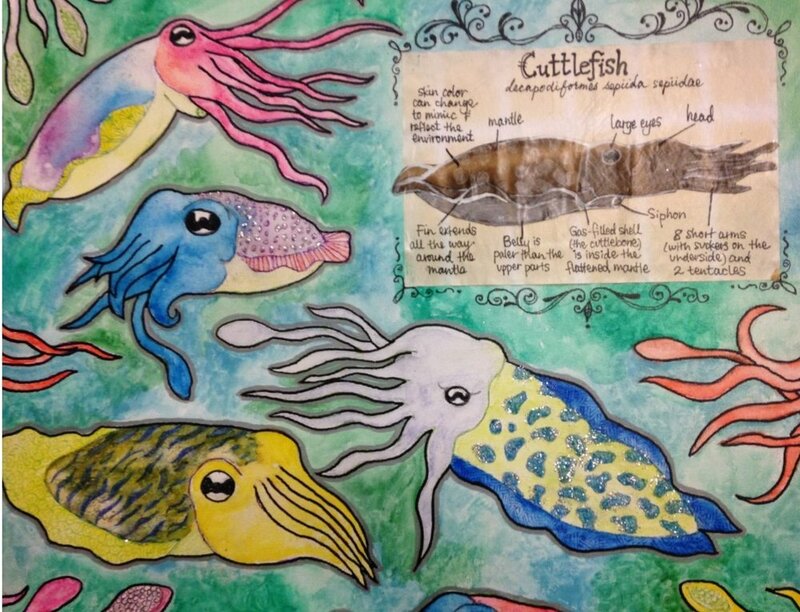 We are sure you will agree that their collage projects are stunning. Wecan't wait to see what they do next! Thank you, Kristy Bowen, for sharing these beauties with us. They are a delight to view! On November 8th, we had our first Read! Talk! Make! Session for this year's title, Grimm's Fairytales. (Since they are plentiful, we used a variety of editions so that finding a copy in the library or through interlibrary loan was easier-and the more varied the illustrations, the better.) 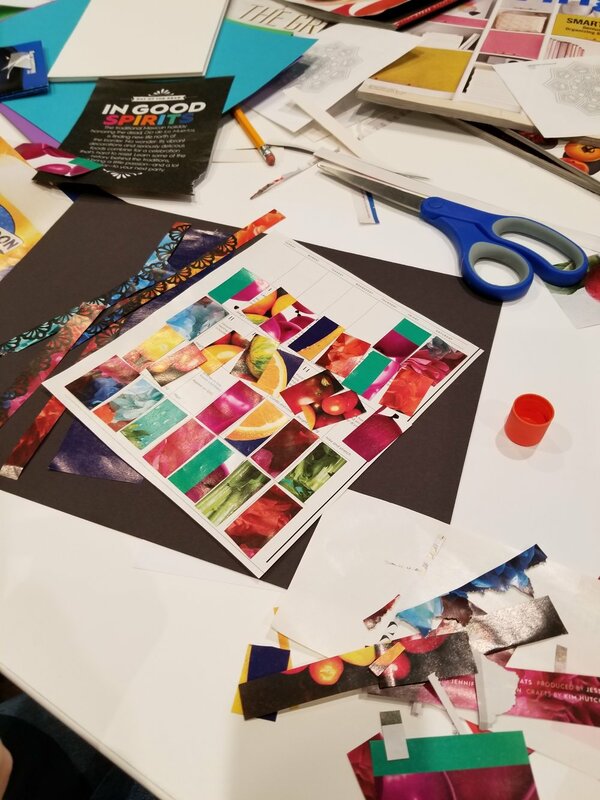 Our mode of choice for this first session was collage. 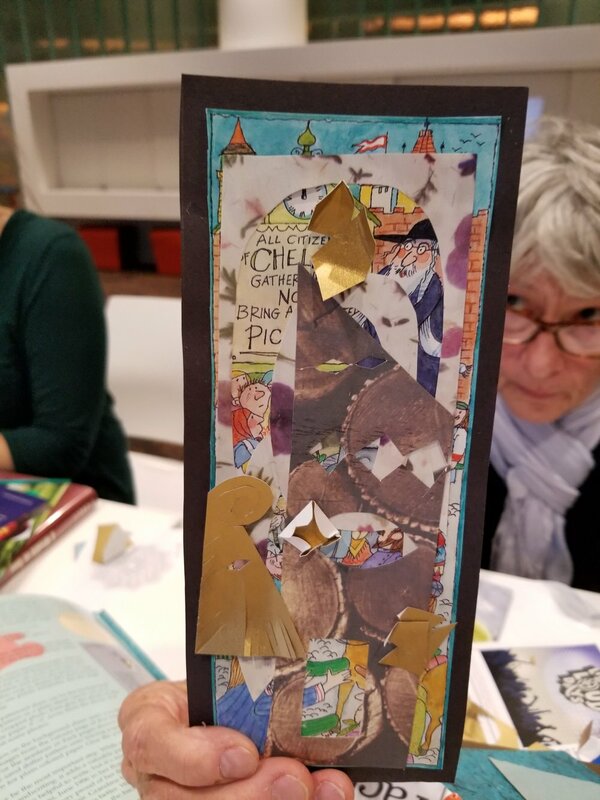 Participants enjoyed discussing the tales, modern reinterpretations of them, and making collages with paper and discarded library materials. Our end goal for the 2017-2018 academic year is to create our own handmade volume of Grimm Tales and accompanying artwork. We are also working on a display case on the library's first floor dedicated to our Book to Art Club selection and creations that will debut in the spring, when we will begin monthly sessions as we complete our book project, which will involve creating pieces for our favorite tales, layout, assembly, and binding. For a season starter Mead Public Library's club coordinated with John Michael Kohler Arts Center to provide Book to Art Club members with a tour and project. The tour was of Mythologies: Eugene von Bruenchenhein and the story was American Gods by Neil Gaiman. The project, inspired by both the exhibit and the book, was design-your-own deity using cast plaster faces, ceramic chicken bones, paint, twine, and wire. Special thanks is owed to Craig Grabhorn for putting this together for us. Judy Wile and Camus have been busy, busy, busy this year! So far they've read The Evolution of Calpurnia Tate by Jacqueline Kelly, The Interestings by Meg Wolitzer, which got them featured in a local newspaper, Breakfast at Tiffany's by Truman Capote, and The Language of Flowers by Vanessa Diffenbaugh. Thank you, Judy, for sharing your club's masterpieces! View slide show gallery for more inspiration! Last night Mead Public Library's Book to Art Club had the privilege of meeting at stunning Bookworm Gardens for a discussion of Lab Girl by Hope Jahren. Armed with scissors, we followed Allissa Montgomery, Gardens and Facilities Manager, on a nature walk and collected specimens for our Hiker Press Kits. Once returned from our walk, we pressed flowers and leaves into our kits, decorated their cardboard covers, examined other specimens on slides under a microscope, and discussed our book. Lab Girl had been a hit, and so was our visit. What a treat it was to be outside among the plants and trees as we discussed a memoir about a geochemist and geobiologist and her work with plants and trees! Camas Public Library's Book to Art Club was recently featured in a local publication, The Columbian. Features Reporter Scott Hewitt wrote a wonderful article highlighting Camas's discussion of "The Interestings" by Meg Wolitzer. Hewitt's honest perception of the inner workings of a book club were spot-on in that each member will have different feelings about a story and its characters. This only enhances a discussion, so do not fret over choosing a title that everyone will adore. Focus on a story that will be interesting to discuss and inspiring to create from. Based on the article's quotes, there were strong opinions of the story and characters, both positive and negative, but all were equally rewarded with s'mores and grown-up merit badges. The projects also varied, ranging from diorama to watercolor painting to summer camp inspired "God's Eye" weaving. "...Wile not only provided s’mores for the group, but also displayed her own artistic take on the book in homemade merit badges for activities that are never, ever allowed at summer camp: Creative Curse Word Usage, “Up S#@!t’s Creek” Canoe Building, and, of course, Conspicuous Beer Consumption..."
Way to go, Judy Wile and Camas Public Library Book to Art Club! Read The Columbian article here! Last Fall Mead Public Library's Book to Art Club moved from our Loft meeting room to the truly inspiring ARTery, John Michael Kohler Arts Center's makerspace. Below are the projects from our first four discussions. Being around the everchanging ARTery has brought out more artistry in all of us. It has also brought in new members. Our "True Grit" discussion, part of the NEA Big Read, had an outstanding attendance of 22 people! It didn't hurt that Craig Grabhorn, Alison Loewen, and Fred Miller from JMKAC coordinated a wonderful tour of the Holy Jewel Home exhibit, home of The Original Rhinestone Cowboy, Roy Bowlin. Craig and Alison also provided us with everything needed to create our own dazzling cowboy projects. As you can see, we had a blast! "The Patron Saint of Ugly" projects were collages influenced by the main character's unique birthmarks. "The Heart of Everything That Is: The Untold Story of Red Cloud, An American Legend" projects focused on lighter, whimsical versions of arrows and dreamcatchers to contrast with the dark and violent story. We ended 2016 with "Challenger Deep" and created scribble art with wire, embroidery floss, and watercolor paint that was inspired by the artwork in the book. 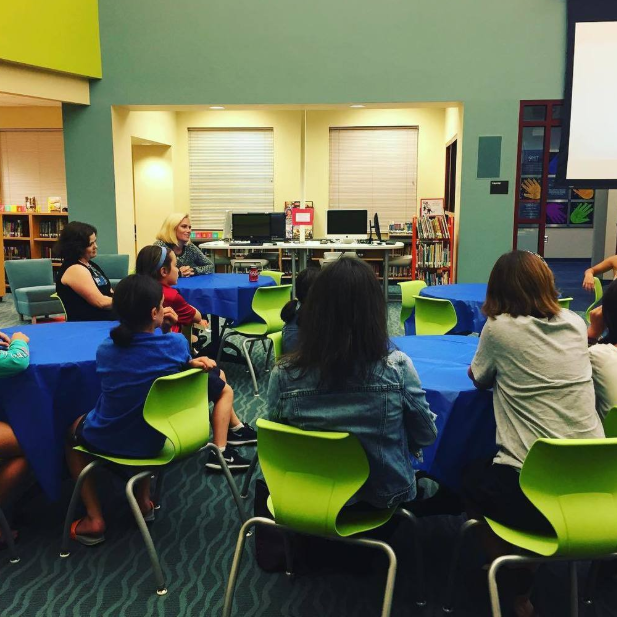 Caley Cannon, Art Librarian at Brand Library and Art Center, recently promoted The Book to Art Club through a presentation she gave at the California Library Association Conference. These are images from her PowerPoint presentation. As you can see, Brand made some wonderful projects during their discussions, and it looks like they had a great time doing it! (I love the paper houses and clay portraits! Your projects are truly inspiring.) 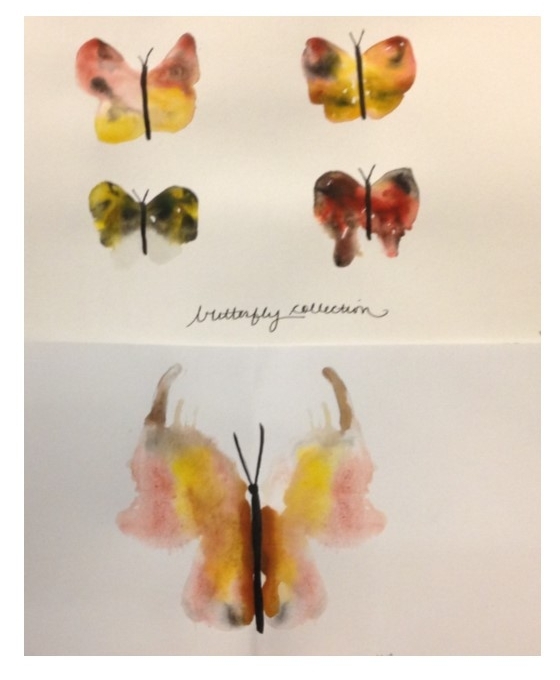 Thank you, Caley, for sharing these with us and for promoting the Book to Art Club! Mead Public Library in Sheboygan had a productive season of reading and making last year. We read a variety of books geared toward both adults and teens. Below are selections from projects we made in Fall of 2015 and Spring of 2016. Scituate Library found success with discussions of "Where'd you go, Bernadette" by Maria Semple, "The Interestings" by Meg Wolitzer, "Chasing Vermeer" by Blue Balliet, and "The Book Thief" by Markus Zusak. Attendees created small crafts or studied different aspects of artists or art that each book talked about, according to Rachael Juskuv. Milwauakee Public Library East's Book to Art Club was busy, busy, busy in 2016! Check out their wonderful projects and reads! (Their sculptures look particularly fun!) We can't wait to see what they have in store for 2017! Thank you Beth Gabriel for submitting this! August: Best of summer reading! Attendees brought their favorite summer read to share while having an open hour of crafting and coloring.